When I was a wee lad, about five years old, my favorite toy was Doggie, a cuddly-soft stuffed animal. This little guy had floppy cloth ears and black button eyes. I played with him during the day and held him tight every night as I drifted off to sleep. Doggie got a lot of my playtime and love, so much so that his fur eventually became worn, an eye was lost, and all the leg stuffing was squeezed down into four very large paws. But it didn’t matter, Doggie was my favorite toy. If he lived in the same world as the toys in Pixar’s three Toy Story films, Doggie would have been held in very high esteem. The Toy Story films show us our digitally-rendered world from a toy’s point of view. Looking back through the entire trilogy, I can see three closely-related lessons that reinforce our daily walks as members of the Body of Christ. Serve others. When we first meet Sheriff Woody, Mr. Potato Head, Hamm the Piggy Bank and the entire community of toys, we learn that their sole purpose is to be there for Andy whenever he wants to play. Each of the toys has a special role in Andy’s imaginative adventures. Hamm and Potato Head are bad guys, Little Bo Peep is the heroine in distress and Woody saves the day as the hero. They are all there to have fun with Andy. Buzz Lightyear, however, believes he has a different purpose: to protect the galaxy from the evil forces of Emperor Zurg. He doesn’t have the perspective of the other toys who know they are playthings. Buzz truly believes he is a member of Star Command and has crash landed on a strange planet. Woody tries to tell Buzz that he is a toy, but Buzz doesn’t believe him. It’s not until Buzz sees a TV commercial with thousands of identical Buzz Lightyear toys on the shelves that he realizes the truth. He proceeds to get hammered on Darjeeling and sink into a dark depression. But he overcomes this feeling and saves the day for Woody and himself. Lord, in this vast, complicated and crowded world, help me to know my individual talents and how they can be used to serve others and thus to serve you. Love your friends and family. 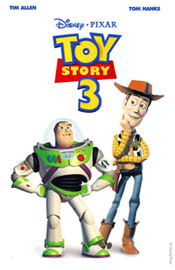 Like other Buddy Films by Hope and Crosby, Martin and Lewis, Abbott and Costello and others, the Toy Stories portray the adventures of two friends: Woody and Buzz. No matter what happens, these two friends look out for each other. When Woody accidentally knocks Buzz out of the window, he goes to rescue him. When Woody is stolen by Al the toy collector, Buzz leads the gang across town to rescue their friend. When his friends are trapped at Sunnyside Daycare, Woody leaves Bonnie’s fun playroom to organize their escape. Lord, help me to recognize the needs of my family and friends and put them above my own selfish desires. Build a community. All children grow up and most leave home for college, and Andy is no exception. The wonderful community of toys in his bedroom has slowly dwindled down to just a few in his old toy chest, waiting patiently to be played with again. When they are accidentally left in a trash bag on the curb, the toys escape and hide in a box of donations for Sunnyside Daycare. At first the toys believe they have arrived in paradise. Andy hasn’t played with them in years, yet here are dozens of children who will play with them every day. However, Woody, Buzz and friends are true babes in toyland, for underneath the bright colored rainbows and spacious playrooms is a dark element to the daycare’s toy community. Managed by an oppressive dictator who is not at all sweet like his strawberry scent, the community subjects new toys to the rough treatment by the younger children. Toys that complain or try to leave are imprisoned and punished. In a happy ending, Barbie and Ken take over as managers of the toy community at Sunnyside Daycare and make some “cool and groovy” changes that make all the toys happy. Woody and gang join the toy community at Bonnie’s house, where toys are loved and played with all day. Lord, make me a channel of your peace to help build a City of God among your people. What happened to my Doggie? As I grew older and paid more attention to Superman, baseball cards and other things, Doggie was often left alone. But when my sister Maria was born, I gave Doggie to her. Once again, someone would play with and love our little Doggie. For a toy, there’s no higher calling. First published in the August 6, 2010 issue of The Tennessee Register.